We have a full range of Motors for Large Crane Applications. Motors for Deck Winchech, Marine, Ship Building and all major ship applications. 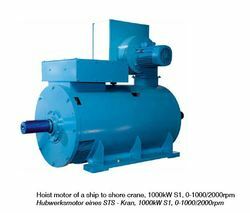 Complete and ready Marine Execution Brake-Motors are used on large STS Cranes, Port Cranes, Yard Cranes, and for large Ship applications. For over 60 years now Franz Wölfer Elektromaschinenfabrik has been developing and manufacturing electric motors for use in hoisting equipment, in and on ships as well as in general mechanical engineering. We apply our extensive know-how to produce highly efficient motors for individually adapted drive mechanism solutions. At our business location in Osnabrück our employees work hard to ensure highest quality standards. Customers throughout the world are convinced by the performance capacity, compactness, dynamics and high degree of efficiency of our innovative products. In the manufacture of hoist motors we are indeed one of the leading companies concerning quality as well as technology. Three phase asynchronous motors made by Wölfer stand out on account of their robust design and their very high performance capacity. They are individually manufactured in accordance with our customers' requirements. The use of special rotors with appropriately adapted geometry makes it possible to achieve excellent control qualities. A high pull out torque guarantees safe operation in the field weakening. On account of their low moment of inertia, these highly dynamic drive motors have the advantage of shorter acceleration time combined with reduced frequency converter current. Consequently smaller frequency converters and reduced cable cross sections can frequently be used. Nominal voltages up to a maximum of 690 volts as well as frequencies and rated speeds are freely selectable for our motors, providing physical and mechanical limit values are observed. Special insulations and special winding wires are used which are almost completely resistant to partial discharges which ensue in frequency converter operation. Many different kinds of control and protection equipment are also available. Furthermore, it is also possible to integrate holding brakes, separately driven fans and other components. All the motors have excellent regulation properties which also mean low life-cycle costs. types of cooling: self-ventilated, separately ventilated, without ventilator, heat exchanger. Our compact special motors are constructed for use under extreme stress conditions in the shipping industry, in particular for bow and stern thrusters on container ships with container capacities in excess of 5,000 TEU. They match to the rules of all well-known classification societies, fulfil the requirements of insulation class F and convince by their optimised energy balance. These motors are also available with heat exchangers. Furthermore holding brakes, separately drive fans, anti-condensation heaters and other components can be additionally integrated. An insulated bearing is recommended for motor for inverter operation. Looking for Electric Motors for Hoist Applications ?